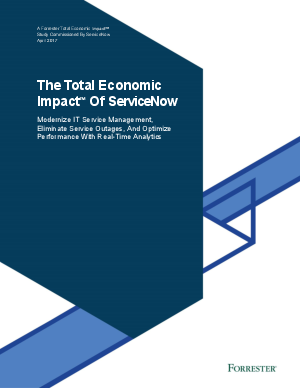 Read The Total Economic Impact™ of ServiceNow, an April 2017 commissioned study conducted by Forrester Consulting on behalf of ServiceNow, to understand the benefits, costs, and risks associated with the following ServiceNow solutions: IT Service Management, IT Operations Management, and Performance Analytics. Forrester interviewed seven current ServiceNow customers with years of experience using the solutions identified above. The purpose of the study is to provide potential customers with a framework to evaluate the real world customer experience and economic impact of the Now platform on their organizations.